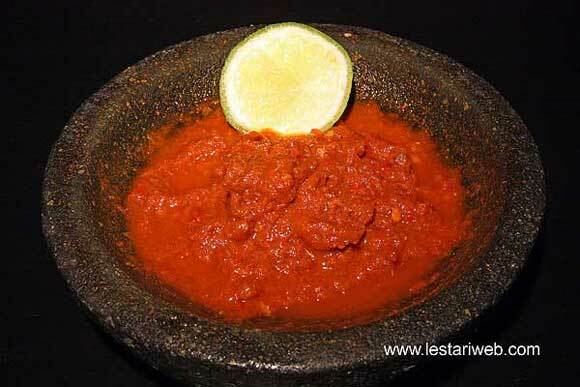 This sambal is usually served together with Rawon or Black Beef Soup. Boil or steam chilies to help the grinding process. Keep away tomato from boiling to get freshly sambal. 1Boil or steam all chilies for about 5 minutes until the chilies get soft. 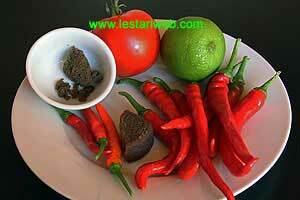 2Put large & bird the chillies in a grinding stone (ulek-ulek) or use mortar & pestle and grind until smooth. 3Add chopped tomato, grind until smooth. 4Add the roasted shrimp paste, grind them once again. Stir to mix. 5Adjust the seasoning, add the salt & sugar (if necessary). 6At last, add the kalamansi or lime juice. Stir to mix. Serve right away with Black Beef Soup/Rawon.